These savory-sweet and tangy vegetables are not only a great side dish, but can also be added to salads or tucked into cooked low-FODMAP grains like quinoa, rice, or buckwheat groats to liven them up. The tricks that add flavor are high heat and roasting in a single layer to allow maximum contact with the hot pan. Preheat oven to 425F. Spray 2 large baking sheets with baking spray or coat with oil. Cut each vegetable into 1 ½ x ½ inch thick pieces. Cutting vegetables into uniformly-sized pieces ensures they will cook at the same rate. Place vegetables in piles in the center of each baking sheet. Drizzle with garlic-infused oil and toss to coat. Sprinkle with thyme, salt, and pepper and toss again. Spread vegetables in a single layer on baking sheets. Place in the middle of the oven and roast until vegetables are a deep golden brown on the bottom, 20 to 25 minutes. While vegetables are roasting, combine maple syrup and balsamic vinegar in a small bowl. Remove pan from oven and drizzle maple vinegar mixture evenly over vegetables, then turn pieces over to coat. Turn vegetable pieces so that an un-browned side is face down on the pan. Return the pan to the oven and roast until the mixture is bubbling and mostly reduced, 5 minutes. Stir vegetable pieces to coat with the syrup mixture. Remove any pieces that appear in danger of burning and return the rest to the oven to roast until mixture is dry, 3 to 4 additional minutes. Remove vegetables from the pan while still quite warm, as they can stick somewhat when cool. Serve warm or at room temperature. This technique has a wide variety of applications for making low-FODMAP vegetables taste great—try it with white potatoes, fennel, cabbage, or bell peppers. Substitute your favorite herbs for the thyme. Rosemary, oregano or dill are other possibilities. 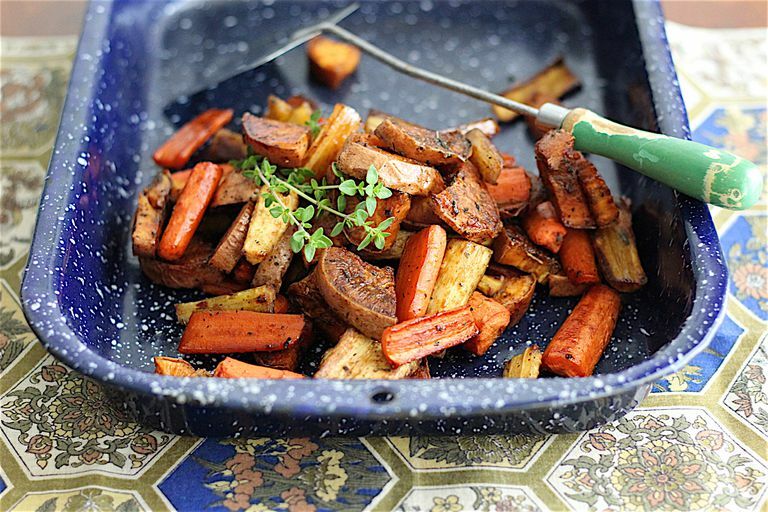 Roast vegetables to enhance their flavor before adding them to any dish, from a soup to a grain bowl.